Here’s the Bright Side: Of Failure, Fear, Cancer, Divorce and Other Bum Raps, Betty Rollin, Random House. No one wants to suffer through any of life’s most painful and difficult experiences—cancer, divorce, death of a loved one, job loss, or any of the countless other possible catastrophes that pose a risk to happiness. But in her new book “Here's the Bright Side,” TV correspondent turned best-selling author Betty Rollin emphasizes the upside to the downside, analyzing post-traumatic growth syndrome and the potential benefits of enduring hardship. Although it may be hard to believe, a surprisingly large number of people who overcome (nearly) insurmountable obstacles report being better for the experience. In fact, some are almost happy to have endured the pain, for it has enhanced their life in surprising and unpredictable ways. Among the commonly reported changes are an improved perception of self, stronger relationships with others, and a newfound appreciation for living. Rollin knows these feelings all too well, having twice been diagnosed with breast cancer (undergoing two masectomies), not to mention getting fired from a plum job at Vogue and going through a divorce. Looking back on it all she “realized that the source of her happiness was of all things, cancer”—hence the inspiration for the book. 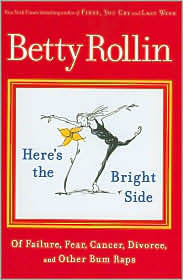 The refreshing thing about “Here's the Bright Side” is that it isn’t overtly inspirational. Rollin doesn’t try to convince the reader that tragedy and disaster is a good thing, only that it might be a blessing in disguise. The Ripple Effect—The Fate of Freshwater in the Twenty-First Century, Alex Prudhomme, Scribner.